Avi is part of a family of writers extending back into the 19th century. Born in 1937 and raised in New York City, Avi was educated in local schools, before going to the Midwest and then back to NYC to complete his education. Starting out as a playwright — while working for many years as a librarian — he began writing books for young people when the first of his kids came along. His first book was Things That Sometimes Happen, published in 1970, and recently reissued. Since then he has published seventy books. Winner of many awards, including the 2003 Newbery award for Crispin: the Cross of Lead (Hyperion), two Newbery Honors, two Horn Book awards, and an O’Dell award, as well as many children’s choice awards, he frequently travels to schools around the country to talk to his readers. Avi lives in Denver, Colorado, with his wife and family. 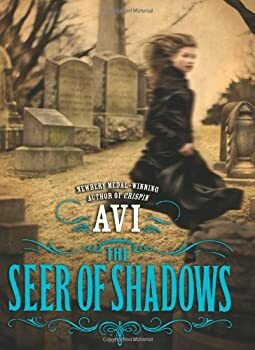 CLICK HERE FOR MORE BOOKS BY AVI. Set in New York City, 1872, we are introduced to Horace Carpetine, a young man who works as an apprentice to a photographer. His employer Mr Middleditch is a rather unscrupulous man, eager to turn a penny whichever way he can, but Horace is captivated by the magic of early photographic techniques. Told in first-person account, Horace describes meeting a young black servant girl called Pegg by the gates of Mr Middleditch’s house, who arranges a photography session with her mistress Mrs Von Macht. Sensing a wealthy woman, Mr Middleditch agrees to the woman’s request to take her picture so that she might leave it on her recently deceased daughter’s tomb.